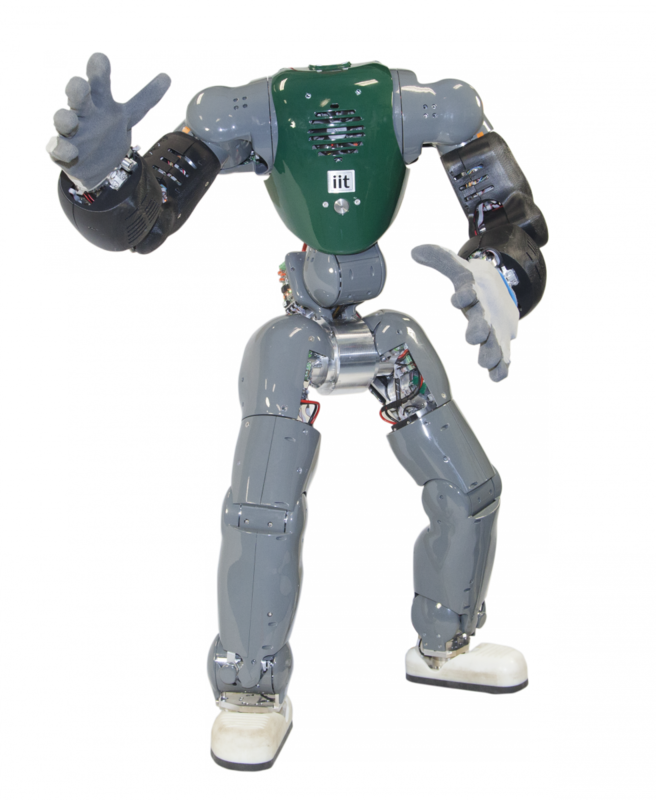 The COMAN humanoid robot, is being developed within the AMARSI European project. The development of COMAN body exploits the use of actuation systems with passive compliance. to reduce the distinction between plant and controller that is typical in traditional control engineering to fully exploit complex body properties. to simplify perception, control and learning and to explore how compliance can be exploited for safer human robot interaction, reduced energy consumption, simplified control, and faster and more aggressive learning. The COMAN robot is 95cm tall, weighs 31kg and has 25 DOF. Its mechanical components are made from titanium alloy, stainless steel and aluminium alloy, giving it good physical robustness. Its modular joint design uses brushless, frameless DC motors, Harmonic Drive gears and series elastic elements. Leg, waist and shoulder joints have a peak torque capability of 55Nm. Custom torque sensors are integrated into every joint to enable active stiffness control and 6-DOF sensors are included at the ankle to measure ground reaction forces. COMAN can walk and balance using inertial sensors in the pelvis and chest, and its series elastic joint design makes it robust against impacts and external disturbances. COMAN is fully power autonomous. The torso contains a dual core Pentium PC104, onboard battery and battery management system giving up to 2½ hours continuous operation. The dynamic model of COMAN is developed in symbolic form using Matlab and Robotran software. The model is also generated in C++, which can be used for simulations in simulink (S-function) or C++ project. Z. Li, N.G. Tsagarakis, and D.G. Caldwell, “Walking pattern generation for a humanoid robot with compliant joints,” Autonomous Robots, 2013. Z. Li, N.G. Tsagarakis, and D.G. Caldwell, “A Passivity Based Admittance Control for Stabilizing the Compliant Humanoid COMAN,” IEEE-RAS International Conference on Humanoid Robots (Humanoids2012), Osaka, Japan (Award for Best Paper Nomination Finalist). H. Dallali, M. Mosadeghzad, G. Medrano-Cerda, N. Tsagarakis, D. Caldwell, A Dynamic Simulator for the Compliant Humanoid Robot, COMAN, in ICRA Wokrshop on Developments of Simulation Tools for Robotics & Biomechanics, Karlsruhe, Germany, May 10, 2013. H. Dallali, M. Mosadeghzad, G. Medrano-Cerda, N. Docquier, P. Kormushev, N. Tsagarakis, Z. Li, D. Caldwell, Development of a Dynamic Simulator for a Compliant Humanoid Robot Based on a Symbolic Multibody Approach, International Conference on Mechatronics, Vicenza, Italy, February 27 - March 1, 2013. J. Lee, H. Dallali, N. Tsagarakis and D. Caldwell, Robust and Model-Free Link Position Tracking Control for Humanoid COMAN with Multiple Compliant Joints, in IEEE Int. Conf. on Humanoid Robots, Oct. 15-17, 2013, Atlanta, Georgia, USA. Z. Li, N.G. Tsagarakis, D.G. Caldwell, “Walking Trajectory Generation for Humanoid Robots with Compliant Joints:Experimentation with COMAN Humanoid", IEEE International Conference on Robotics and Automation (ICRA), May,2012, USA. Z. Li, Bram Vanderborght, N.G. Tsagarakis, L. Colasanto, D.G. Caldwell, “Stabilization for the Compliant Humanoid Robot COMAN Exploiting Intrinsic and Controlled Compliance", IEEE International Conference on Robotics and Automation (ICRA), May, 2012, USA. N.G. Tsagarakis, S. Morfey, G. A. Medrano-Cerda, Z. Li and D.G. Caldwell "COMAN a Compliant Humanoid: Optimal Joint Stiffness Tuning for Modal Frequency Control", IEEE ICRA 2013. E. Spyrakos-Papastavridis, G. Medrano-Cerda, N. G. Tsagarakis, J. S. Dai and D. G. Caldwell, 'A Compliant Humanoid Walking Strategy Based on the Switching of State Feedback Gravity Compensation Controllers,' IEEE/RSJ International Conference on Intelligent Robots and Systems, IROS 2013 (Accepted). E. Spyrakos-Papastavridis, G. Medrano-Cerda, N. G. Tsagarakis, J. S. Dai and D. G. Caldwell, 'Gravity Compensation Control of Compliant Joint Systems with Multiple Drives,' IEEE International Conference on Robotics and Automation, ICRA 2013. E. Spyrakos-Papastavridis, G. Medrano-Cerda, N. G. Tsagarakis, J. S. Dai and D. G. Caldwell, 'A Push Recovery Strategy for a Passively Compliant Humanoid Robot using Decentralized LQR Controllers,' IEEE International Conference on Mechatronics, ICM 2013. E. Spyrakos-Papastavridis, G. Medrano-Cerda, J. S. Dai and D. G. Caldwell, 'Global Stability Study of A Compliant Double-Inverted Pendulum Based on Hamiltonian Modeling,' ASME International Design and Technical Conferences & Computers and Information in Engineering Conference, IDETC/CIE 2012. L. Colasanto, N.G. Tsagarakis, D.G. Caldwell, “A Compact Model for the Compliant Humanoid Robot COMAN”, IEEE BIOROB 2012. P.Kormushev, B. Ugurlu, Luca Colasanto, N. Tsagarakis, and D.G. Caldwell, "The Anatomy of a Fall: Automated Real-time Analysis of Raw Force Sensor Data from Bipedal Walking Robots and Humans", International Conference on Intelligent Robots and Systems (IROS 2012). Luca Colasanto, N.G. Tsagarakis, Zhibin Li, Darwin G. Caldwell, “Internal Model Control Strategy in Cartesian Space for a Compliant Humanoid Robot“, International Conference on Intelligent Robots and Systems (IROS 2012), pp 5347-5352 . Luca Colasanto, Petar Kormushev, Nikolaos Tsagarakis, Darwin G. Caldwell. Optimization of a compact model for the compliant humanoid robot COMAN using reinforcement learning. International Journal of Cybernetics and Information Technologies, Vol. 12, No. 3, pp. 76-85, 2012. F.L. Moro, N.G. Tsagarakis, D.G. Caldwell, "The kinematic Motion Primitives (kMPs) of periodic motions, discrete motions, and motions that are a combination of discrete and periodic movements", Cognitive Neuroscience Robotics (CNR) Workshop at the IEEE/RSJ International Conference on Intelligent Robots and Systems (IROS), Vilamoura, Algarve, Portugal (2012). F.L. Moro, M. Gienger, A. Goswami, N.G. Tsagarakis, D.G. Caldwell, "An Attractor-based Whole-Body Motion Control (WBMC) System for Humanoid Robots”, IEEE-RAS International Conference on Humanoid Robots (Humanoids), Atlanta, Georgia, USA (2013. F.L. Moro, N.G. Tsagarakis, D.G. Caldwell, "Efficient Human-Like Walking for the COmpliant huMANoid COMAN based on Kinematic Motion Primitives (kMPs)", IEEE International Conference on Robotics and Automation (ICRA), Saint Paul, Minnesota, USA (2012). F.L. Moro, N.G. Tsagarakis, D.G. Caldwell, "Walking in the Resonance with the COMAN Robot with Trajectories based on Human Kinematic Motion Primitives (kMPs)", Autonomous Robots (2013). F.L. Moro, A. Spröwitz, A. Tuleu, M. Vespignani, N.G. Tsagarakis, A.J. Ijspeert, D.G. Caldwell, "Horse-Like Walking, Trotting and Galloping derived from Kinematic Motion Primitives (kMPs) and their Application to Walk/Trot Transitions in a Compliant Quadruped Robot" , Biological Cybernetics, 107(3), pp. 309-320 (2013). F.L. Moro, N.G. Tsagarakis, D.G. Caldwell, "On the kinematic Motion Primitives (kMPs) - theory and application", Frontiers in Neurorobotics, 6(10) (2012). B. Ugurlu, N. G. Tsagarakis, E. Spyrakos-Papastavridis and D. G. Caldwell, 'Compliant joint modification and real-time dynamic walking implementation on bipedal robot ccub,' IEEE International Conference on Mechatronics, ICM 2011. F.L. Moro, N.G. Tsagarakis, D.G. Caldwell, "A Human-like Walking for the Compliant Humanoid COMAN based on CoM Trajectory Reconstruction from Kinematic Motion Primitives", IEEE-RAS International Conference on Humanoid Robots (Humanoids), Bled, Slovenia (2011). B. Ugurlu, J.A. Saglia, N.G. Tsagarakis, D.G. Caldwell, Hopping at the Resonance Frequency: A Trajectory Generation Technique for Bipedal Robots with Elastic Joints, IEEE International Conference on Robotics and Automation, Saint Paul, Minnesota US, 14-18 May, 2012. P. Kormushev, B. Ugurlu, S. Calinon, N.G. Tsagarakis, D.G. Caldwell, "Bipedal Walking Energy Minimization by Reinforcement Learning with Evolving Policy Parameterization", 2011 IEEE/RSJ International Conference on Intelligent Robots and Systems, pp318-324, (IROS 2011). N.G. Tsagarakis, Z. Li, J.A. Saglia, D.G. Caldwell, "The Design of the Lower Body of the Compliant Humanoid Robot 'cCub'", IEEE International Conference on Robotics and Automation Conference, pp2035 - 2040 , (ICRA 2011). Z. Li, B. Vanderborght,N.G. Tsagarakis, D.G. Caldwell, "Fast Bipedal Walk Using Large Strides by Modulating Hip Posture and Toe-heel Motion" , IEEE ROBIO 2010.